What’s the cause of the biggest argument at organized sports games? It’s certainly not the fan next to you or even the opposing team. It’s the judgment calls of the game’s referees. Instant replay has tried to solve some of those disputes, but you’re still relying on camera angles and line of sight. Enter an even more high-tech system: the RFID-enabled smartball from Adidas. “Was that a goal?” is a question the smartball was meant to decide. To see if it works, the International Football Association Board, the ruling arm of international football, debated at its February meeting whether technology could help match officials make quick decisions in unclear situations, such as whether a goal has been scored or not. 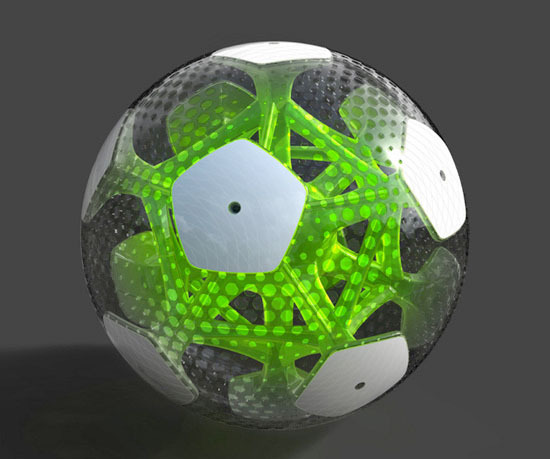 The board heard presentations from FIFA partner Adidas, which, together with the German company, Cairos AG and the German Fraunhofer Institute, have developed a system that includes a ball with an embedded electronic chip. The presentation also outlined the necessary stadium infrastructure and demonstrated how the entire system would work. Following the presentation, the IFAB decided to allow the system to be tested in competitive football during the Under 17 championship in Peru Sept. 16 to Oct. 2. The IFAB is composed of the football associations of England, Scotland, Wales and Northern Ireland, who each have a vote, together with FIFA, who represents the other 201 member associations with four votes. For a proposal to succeed, it must receive the support of at least three-quarters of those present and entitled to vote. The Adidas smartball seems to have been a success. Of course, according to reports, every goal in which the smartball was used, was clear cut. In other words, there were no disputes about whether it was a goal or not. Guenter Pfau, Adidas AG’s manager for relations with FIFA, told Reuters the ball performed well in almost a week of matches in Peru. “Cairos and Adidas are pleased with the performance of the chip and construction of the ball,” he said. If Adidas’ smartball technology takes off with soccer/football fans, can similar uses not be far behind, such as in U.S. football, basketball, and even baseball? RFID, which may be changing the face of supply chain management, now has a good shot at settling a lot of sports-related arguments, not just whether it was a goal or not. Instant replays, at least in the U.S., are the technology of choice in sportsdom’s continual quest to keep referees from being the deciding factor in a game, particularly football U.S. style. But in football, a player could step on the out-of-bounds line, yet the ball could still be in bounds. The smartball couldn’t work in determining this, but it still could be used, as with soccer, to determine if the ball, clutched in a player’s hands and buried beneath a pile of bodies during a goal line stand, has actually crossed the goal. It could also be used in basketball, at least in determining if the ball went out of bounds. Smartball could unequivocally make that decision for the refs. But that’s only half the story. It couldn’t tell which player touched it last. And then there’s the question of players stepping out of bounds–or not–as in the example above. Is the next step, then, to include RFID chips into a player’s shoes? Then you’ll know for sure if he stepped out of bounds. Adidas already markets a self-adjusting shoe that includes a sensor and tiny electric motor. So where does this technology go from here? One test won’t guarantee commercial success. Even FIFA, which supervised the smartball trial, hasn’t spoken up about the ball’s future. But when the IFAB first approved its use, it was suggested that the ball, if successful in Peru, would make an appearance at the World Cub matches next year in Germany.